Wonders are rare in this world! But when it comes to India tourism, you can find plenty of them. Obviously, watching the wonder monument Taj Mahal and enjoying a wonder safari while clicking the tigers in India is no less than a trip to heaven! So the story starts with my summer vacations this year when my friends planned a Taj – Tiger Tour. As per the Taj – Tiger Tour Guide, we were supposed to wander through the mesmerizing monuments of Delhi before leaving to the Jim Corbett National Park. However, we were familiar with places like the Red Fort, Qutub Minar, Old Fort, Raj Ghat and India Gate. But it was fun watching these historically important sites again. The next morning, we left for the Jim Corbett National Park in the foothills of Himalaya. This renowned national Park is named after the renowned hunter and naturalist – Jim Corbett. The guide there told us that the entire park spreads over 1300 sq km and we had to hire a jeep to explore the main parts of Corbett. We spend the entire evening while exploring the breathtaking Khinanauli range. The next day, we enjoyed the best jeep safari of our lives. The guide told us that there are very strong chances of spotting tigers or elephants in summers here, as the animals often visit the small lake inside the park. Lucky was how I felt when I spotted a tiger with its two cubs resting amidst the lush greens. I could easily click it with my tele-zoom camera from the outer boundary of the prohibited area. That full day jungle trip was so charming and remarkable that I even had dreams of it in the night. Next morning, we headed towards Dhikala by Canter (16 seater vehicle) for a half day sightseeing trip to Jim Corbett Museum. This is the place that showcases the antique belongings of Mr. Jim Corbett and some of the rarest texts about him. While returning back from our tiger tour, we also enjoyed the superb elephant safari. 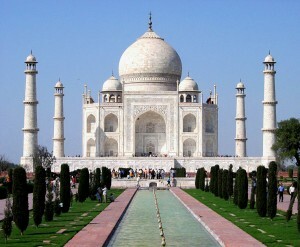 The last day of our trip was dedicated to Taj Mahal tourism and the wonder city Agra, in Uttar Pradesh. The true beauty of this city lies in the serene River Yamuna. Most of the Mughal monuments in Agra – including Taj Mahal, Agra Fort & Fatehpur Sikri – are declared as UNESCO World Heritage sites. Undoubtedly, the Taj Mahal – the symbol of eternal love and a tribute to Queen Mumtaz Mahal by Emperor Shah Jahan – tops the charts with its spotless beauty covered in pure white marbles. Sikandra, the tomb of Emperor Akbar, is also a real treat to the eyes in Agra. This way, the Taj – Tiger Tour Package proves to be a true blessing for all the tourists who admire historical monuments, divine natural beauty, enchanting wildlife, thrilling adventure and traditional art & culture.